When you're traveling in northern California, it starts to feel like all you do is look up at the treetops, gazing in awe at the coastal redwood trees. The drive is one of Northern California's most scenic drives called the Redwood Highway. At Prairie Creek Redwoods State Park, the trees are smaller than in others on the Northern California coast, and you can stop doing that for a while. 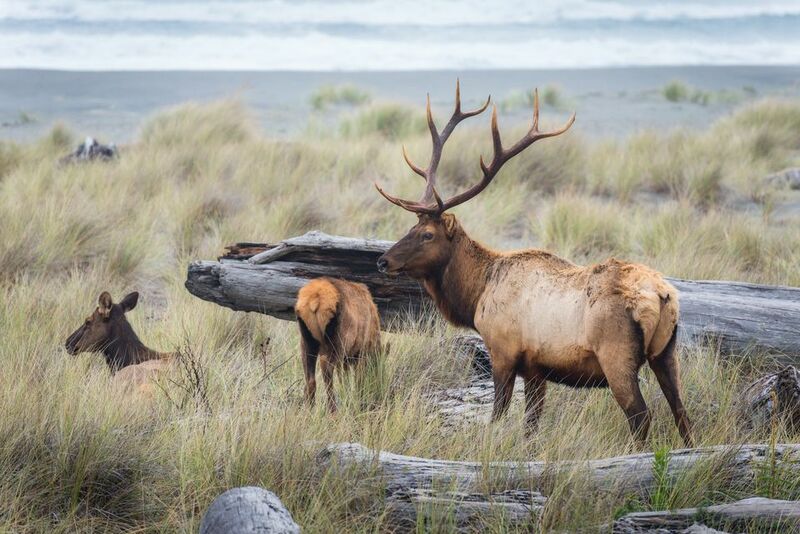 While you rest your neck muscles, you can see Roosevelt elk graze and mate in the meadows, go camping on the beach or take a hike through a fern-filled canyon that looks like a scene straight out of "Jurrasic Park" (because it is). Along with Del Norte Coast and Jedediah Smith parks, Prairie Creek is part of the Redwood National and State Park. Together, they protect almost half of California's remaining old-growth redwoods, trees whose average age is 500 to 700 years. It's an area so important that it has been named a World Heritage Site and International Biosphere Reserve. Because Prairie Creek is right off US Highway 101 between Eureka and Crescent City, it's easy to visit, even if you only stay a short time. Roosevelt Elk: All you have to do to see the elk at Prairie Creek to go during mating season (August to October). You can't miss them grazing in the meadows, while the bulls bellow and challenge each other for mating rights. Stop in the picnic area near the visitors center or turn off onto Davison Road where you can view them from turnouts. Hiking: The park has 74 miles of hiking trails and a 19-mile bike loop. Get some ideas and trail descriptions at Redwood Hikes or stop at the visitor center and ask a ranger for advice. The Redwood Access Trail is designed to allow people with physical limitations a chance to experience the forest. Fern Canyon: It's an exceptionally beautiful (and easy) hike through Fern Canyon, whose 50-foot-tall walls look like hanging gardens, draped with seven kinds of ferns. The environment is so lush and primeval-looking that it was used as a setting in the film "Jurassic Park." To get there, take Davison Road from US Hwy 101. It's an 8-mile drive, part of it on a dirt road and you will have to pay a national park day use fee to get there. At Prairie Creek, you can camp in trailers up to 24 feet long and bring campers and motorhomes up to 27 feet. The park is seldom over- busy, but reservations are a good idea just to be sure you aren't disappointed with a "no vacancy" sign. Making those reservations through the California state system is particularly complicated. Elk Prairie Campground has both family sites and hike/bike sites. Before reserving, take a look at the campground map. At Elk Prairie, you'll also find a few cabins. They are ADA accessible, with electricity, heaters, and lights but no kitchens or bathrooms. Each one can sleep six people. Pets are not allowed, and you have to bring your own bedding. Gold Bluffs Beach Campground is one of the few places in California where you can camp right next to (but not on) the beach. It sounds idyllic but the wind can blow hard, and you need to take some serious tent stakes just in case. Gold Bluffs has both tent and RV sites. If your RV is more than 8 feet wide or 24 feet long, you're out of luck because of you can't drive it on the roads leading to the campground. There are no hookups or sanitation stations. Only a few campsites are on the ocean side of this small campground and reservations are essential. You can see the campsite locations on this map. Even though it is within the national park fee area, campground reservations are made through the state parks system, which is more confusing than you might expect. Black bears live in and around Prairie Creek. Most of them stay in the woods and are not dangerous to people. All campsite have bear boxes for food storage. Find out how to stay bear safe in a California campground. If you want to watch the elk from the comfort of a luxury cabin, you can stay at the privately-owned Elk Meadow Cabins which is just north of Davison Road. Keep your campsite or picnic area clean. Pick up every single crumb you drop and don't feed any wildlife in the park. That's not just someone's over-obsessive housekeeping rule, but essential to protect the chubby, endangered sea-going marbled murrelets. They're related to puffins but nest inland in the park's coastal redwood trees. Food scraps attract hungry crows, ravens, and jays that also destroy and eat murrelet eggs and chicks. Prairie Creek is a state park. The map makes it look like Gold Bluffs Beach and Fern Canyon are part of that state park, but they are in Redwoods National Park instead. To enter the national park, you will have to pay a day use fee, a fact that is not stated on the signs that point you toward it and only discovered after traveling for 20 minutes or more on dirt roads. Summer high temperatures range from 40°F to 75°F but can be cooler near the coast. Fog is common in both the morning and afternoon. In winter, the high will be 35°F to 55°F during the day. The average rainfall is 60 to 80 inches per year and most of it falls from October through April. Dogs must be on a leash no more than six feet long and must be confined to a tent or vehicle at night. Except for service animals, pets are not allowed on trails. The park is 50 miles north of Eureka and 25 miles south of Crescent City. The main part of the park is located on U.S. Highway 101. To get to Gold Bluffs Beach Campground and Fern Canyon, take Davison Road, three miles north of Orick off of U.S. Highway 101.